Disclaimer: I started this post on 9/19, when Addison turned 11 months old and am finally finishing it. Only one more month of bottles and formula. It is going by way too fast and I'm not ready to lose my baby. This month she transformed into a busy toddler and no longer crawls. She wants to be everywhere that Zack is and doing what he is doing. She is quickly picking up on baby sign language and signs, more, all done and her own version of water (blowing a kiss). I have a feeling that next month she'll know too many signs to list. She is getting closer to becoming a Daddy's Girl, but mom is still #1. Ryan prefers the older stages of babyhood and they have been doing some bonding lately (aka wrestling). Her top two teeth are finally poking through, so hopefully she has some relief from the teething pain. She loves to dance, bobs up and down to the music, being outside, baths, rattles and noise makers, phones, and pressing buttons on the TV. Friday after work we packed up the car and headed south. Eight hours later we were in Tennessee visiting Grandma Sharon and Grandpa Jim for four days. Addison wasn't happy soon after the trip began, so we stopped for a bottle and some running around. She soon fell asleep and we had a peaceful rest of the trip. Hopefully Tuesday's drive home will go okay. We will be traveling during the day, so she will probably be awake more. Yesterday we went to a state park and walked on trails and had a picnic. Here is Addie B during the picnic. 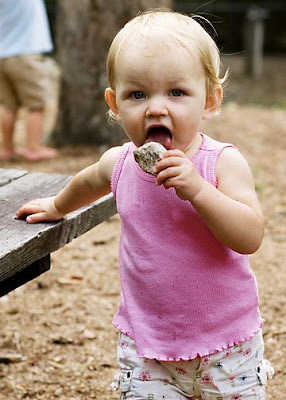 She chose to snack on a rock.